Mars (detail), ca. 1600. After a model by or in the style of Tiziano Aspetti (Italian, Padua 1559/1565–1607 Pisa). Bronze. The Metropolitan Museum of Art, New York, Robert Lehman Collection, 1975 (1975.1.1387a). 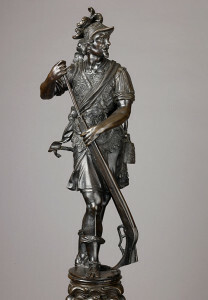 In celebration of the recently published catalogue of Robert Lehman’s collection of European sculpture and metalwork, this exhibition, Italian Renaissance and Baroque Bronze Sculpture from the Robert Lehman Collection, presents a selection of Italian bronze sculpture of the sixteenth and early seventeenth centuries, displayed as a group for the first time. Featuring bronze casts after models created by masters such as Severo da Ravenna and Desiderio da Firenze, this selection includes independent figural statuettes as well as functional objects created in key centers of Italian bronze production, in particular Padua and Venice. If you love dogs, not hot dogs but real doggies, then you’ll really love the Barking Dog Luncheonette, as the décor features everything with a dog on it. The food, is your regular diner fare with plenty of burger, sandwich, and hot plate options. Grab a drink and feel like you were transported to the late 1800’s at The Auction House. With ornamental red velvet couches, exposed brick walls, and vintage chandeliers, this hidden gem of a bar is cozy. Beautifully designed, Uptown Lounge is a bar and restaurant serving American fare like Apple Peppercorn Pork Chops ($18), while being big enough to stick around afterwards for drinks.